After a five-month season, 10 swim meets and countless hours in the pool, the men’s and women’s swim teams’ final conference ranks are decided by just one championship meet. 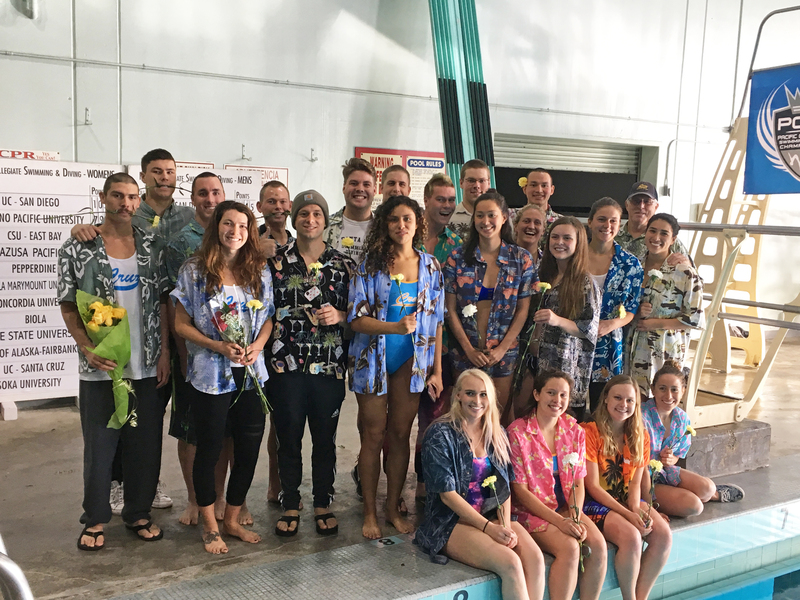 Unlike other sports, where the record is determined by an entire season of games, the swim team’s placement in the NCAA DIII championships rests on their performance at the Pacific Collegiate Swim Conference (PCSC). The swim team travelled to East L.A. for the PCSC on Feb. 8-11 to compete against 16 other schools. As the only DIII team in PCSC — all other teams being DI or DII — the Slugs’ competition was tough. This year, the men’s team placed 3 out of 6 and the women’s team placed 9 out of 12. Last year, the men’s finished 2 out of 6 and the women’s finished 8 out of 10. Most swimmers’ times placed in the middle bracket of the results, ranging from ninth to 16th place, with some in the top eight. Senior Ivan Garin came in fourth in the men’s 50-yard freestyle, third in the men’s 100 yard freestyle and fourth in the men’s 100-yard butterfly. Senior Ryan Michelle Carter came in 8 out of 40 in the women’s 100-yard freestyle. Garin is the only Slug whose times likely qualified him for the NCAA tournament in Texas this March. The coaches are confident he qualified, since he made it last year. They find out next week. Because there are comparatively more women’s teams, the competition is tougher. It’s harder for women to make it into the finals than for men because there are more competitors. With only 17 female members, the team has the bare amount of swimmers to be competitive. The women’s performance was hindered at the conference by the loss of some of their best swimmers due to academic eligibility and time constraints earlier in the season, but the Slugs were able to pull through and beat two DII schools. The potential loss of NCAA athletics at UCSC has hurt the women’s recruiting prospects, according to head coach Kim Musch, by limiting the amount of incoming talent available to the team. Despite some setbacks on the women’s side, both teams’ performances at the conference were the result of much training and sacrifice. Besides swimming all season, the swimmers have training camp over winter break where they each swim up to 10 miles a day. During the month before the conference meet, the team begins a taper, where swimmers modify and gradually reduce their workouts over a month to maximize their athletic ability and fine tune technique. In addition to the intense physical training, both teams have their own traditions to bond and build camaraderie in anticipation for the race. Building off of the men’s tradition, the women decided to start their own hair styling ritual, though not one as extreme. These preparations create a close, family-like atmosphere amidst the pressure and emotions running high before the competition. Though each member competes separately and moves forward in the competition based on their performances, they are one team.